Work at Union Station has progressed to the point where the existing link between the railway and subway stations is affected by construction. Of the two stairways leading from the south side of Front Street down to the subway, the western one is now closed. 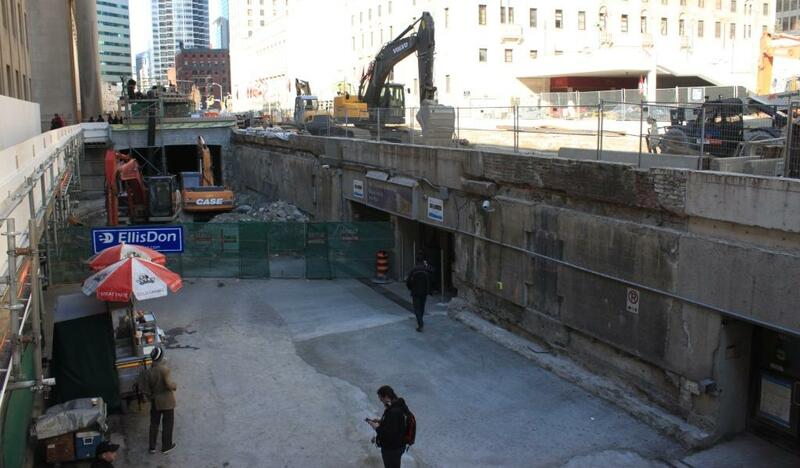 These arrangements will allow for construction of the western part of the new fare control area under Front Street. The moat looking west. The hot dog vendor is still doing business surrounded by construction, but the westmost exit from the subway mezzanine is fenced off. 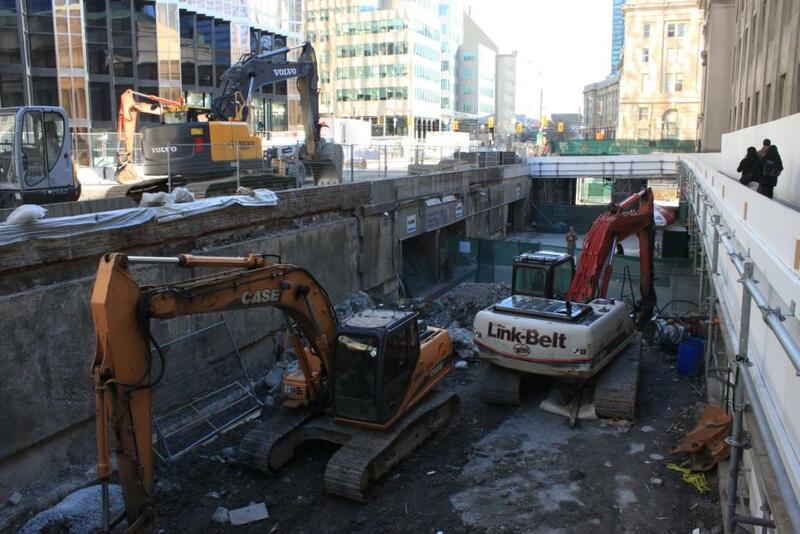 The excavation directly in front of the main doors of Union Railway Station. 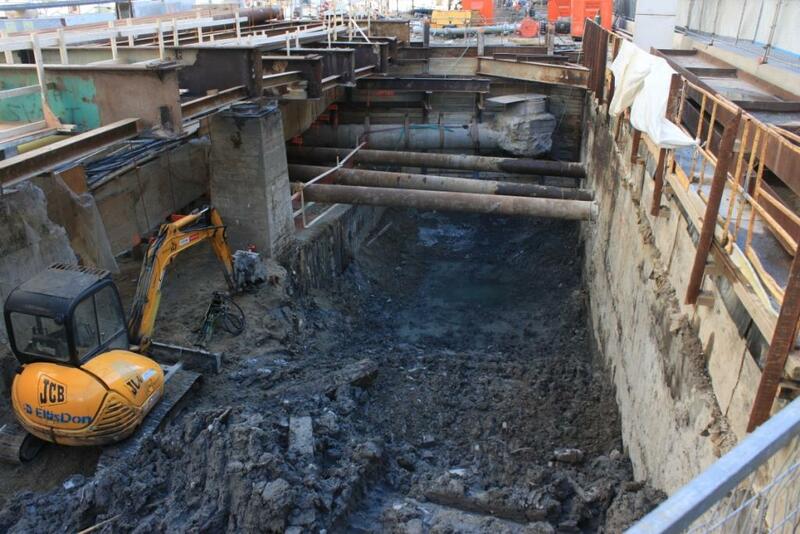 The large concrete box on the left side of the photo is the subway station, and the deep trench will be the space for the new northbound-to-Yonge platform. On the weekend of March 23 to 26 starting at midnight on Friday the TTC will close the Yonge subway between Bloor and Union for the first stage of installation of the new crossover at King Station. Preliminary work is already underway, and there is a slow order through this area. If past experiences at College and St. Clair are any indication, we can expect two more shutdowns in coming months. Activation of the three new crossovers will not occur until the signal system replacement project finishes in a few years. The original crossovers at these locations were never electrified and there is no provision in the existing signal system to manage them. Also, the power feeds on either side of the crossovers are not set up to allow isolation of the crossover territory as a terminal. When Bloor crossover was done many years ago, new section gaps were added at the south end of the station and midway north to Rosedale so that power could be maintained on both sides of a crossover even if there were a shutdown further north or south of Bloor. Changes to the power feeds will be done concurrently with the signal work. This entry was posted in Subways, Transit, Union Station. Bookmark the permalink. Earlier this week one of the workers mopping up the rainwater collecting at the doors to Union Station were warning all of the commuters that the stairwell and fare collection booth would be closing in two weeks and alternate plans should be made. Everyone grumbled about the notice but seemed thankful for the heads up as there was no signage about the change. (Unlike the stairway closure that missed its mark by one full season.) It seems he was off by about a week and a half! Did the unseasonably mild winter speed up the construction schedule? Steve: Who knows. I won’t be surprised to see the west fare booth and accesses to the platform disappear at some point, but the TTC has not published any info on the construction staging. The info on their site is quite useless. I never understood why the TTC had two separate mezzanines at Union. Steve: Originally there was only one. Things were rearranged when additional stairs/escalators were added. The current scheme provides a direct path from the Royal Bank concourse (which did not exist in 1954) to the railway station. I also never understood why Sheppard station didn’t have the bus bay within paid area (like it became when it changed to Sheppar-dYonge). Steve: Because when the station was designed, the Sheppard bus was in Zone 2 and therefore outside of the paid area. The same situation existed at York Mills, Victoria Park, Warden, Old Mill, Royal York and Islington. By the time Kipling and Kennedy were designed, the whole of Metro was Zone 1. The impact of the TTC’s two-zone fare system, where the subway and the central core was in Zone 1 and the suburbs in Zone 2, can be seen in the designs of Royal York and Main Street stations, which have huge empty mezzanines between the subway platforms and the bus terminal. Now look at Jane station, which has a similar mezzanine level, but a fare barrier. That large mezzanine was where the fare barriers were for Royal York and Main Street before the two-zone system was removed and direct transfers allowed between surface transit and subway. Activation of the three new crossovers will not occur until the signal system replacement project finishes in a few years. Great! What a waste of money doing it now. Steve: These are all complex projects that took three weekends each to physically install, and more work around this to prep and finish up the site. The work is spread over time to avoid having the subway shut down for many weekends in a row to do them all at once. The original crossovers at these locations were never electrified and there is no provision in the existing signal system to manage them. Then what were they built for? Steve: Manual turnbacks, except that these proved impractical. Also, the power feeds on either side of the crossovers are not set up to allow isolation of the crossover territory as a terminal. Steve: If the crossover is the point of isolation between one power section and the next, and the power is off in section “A” because of an emergency, a train from section “B” cannot go through the crossover to reverse because there is no power on the far side. The approaches to the crossover and the crossover itself need to have independent power feeds so that they can be “alive” even when trackage beyond the turnback area is shut down. What all this speaks to is poor design probably brought on by an unfamiliarity with what subway operations would actually entail when the Yonge line was being designed. Also, they were probably trying to save money. Wow, this will likely have a negative safety impact as well. The bottleneck of people that already existed going from the GO to TTC in the morning was horrible and already exhibited regular signs of people bumping and snapping at each other… I can only imagine how it will be now. Impatient people going to work are not the kindest people to be funneling into an even smaller hole! What a bad design to have no alternative. Don’t forget that when this station was opened in 1954 the amount of transfer traffic from the train station to the subway and the number of people coming off commuter trains were minuscule. The design was not bad; it just had no way of anticipating that 150,000 people per day would use it. Even it 1967 when GO started there was no idea of how popular it would become. It was not a bad design; it just was designed for a different era. TTC has been trying to get Union Subway Station re built for a long time but funding was not available until GO wanted to redo Union. The blame lies not with the designers and engineers but rather with short sighted politicians. From what I heard, they are building one Union platform for University-Spadina trains and one for Yonge trains correct? But are any going to run straight from Finch to Downsview, or should I say, Vaughan, and vice versa? If not then essentially they’re splitting the line up into two different lines which interchange at Union station. Back in the olden days, with St. George as terminus and Lower Bay active, there were the routes Yonge University Danforth/Bloor and it was as if each one was a different line. Then they became the YUS and BD we know today. Not sure if splitting YUS this way is a good idea (other than to ease the crowding situation at Union with a second platform), wouldn’t it require separate ATO on either branch of the line? And wouldn’t it take up more time since passangers would need to switch trains at Union station? Steve: You are completely off base on the operation of the new station. There are no changes to the track layout, and trains will run through from Finch to Downsview as they do today. The existing platform will eventually serve only University-bound trains. Stairs and escalators on it will be shifted south to give more platform space beside trains. The second platform will be built behind what is now the south wall of the station, and it will serve Yonge-bound trains. It is actually at the same level as Union Station Loop, and you will be able to walk directly between the Yonge platform and the streetcar loop with no change in level. I might be wrong but did the TTC not remove some crossovers at the bottom end after they opened the University line. Are there not openings between the north and south tracks where there were. Steve: The original Yonge line had manual crossovers at Rosehill (south of St. Clair), Bloor, College and King. These crossovers were rarely used because of the complexity and time involved in manually switching trains. Bloor’s was electrified (with associated signalling and power distribution changes) as part of the project to extend the subway north of Eglinton (providing a short turn capability at a critical location), but the other three were removed to save on the cost of replacing worn out special work that was never used. That’s why there are already gaps in the central tunnel wall at the locations of the “new” crossovers.